After working with the raw materials to install Hortonworks Data Platform HDP on Windows in an Azure IaaS VM, I came across the automated install tool from Hortonworks. You get it from github and run the exe included. It uses a config file to describe where all the install files are such as python, java, etc. and it goes through and installs them all. It then runs smoke tests to see if everything is working. An easy way to get a cluster up and running! I was working with Power Query for Excel and needed to parse a tab separated file. Unfortunately there isn’t a TSV option directly in Power Query. I couldn’t find much information on how to tackle this so I’ll post here. The first thing I ended up doing was importing the tab separated file as a CSV. This added three steps to Power Query. The first step looked like this. If you look at the documentation for Csv.Document, you’ll see that the third parameter is the delimiter. Unfortunately something like “/t” doesn’t work in PQ so I had to figure out what it is. I found that this messed up the next steps so I ended up creating a blank query and adding this as the source step. This set up the FirstRowAsHeader step and the ChangedType step. Well – I’ve been so busy lately that I haven’t had much time to blog, but I wanted to make an announcement here that I’m taking a job at Microsoft. I’ll be starting in a couple weeks as a TS for the Data Platform out of the North Central District. I’m really excited and hopefully I’ll be doing a little more blogging here as a result. Did you know that SQL Server Management Studio makes a nice little regular expression (regex) editor and tester? Go to find and replace (Ctrl-H) and down at the bottom of the dialog box is a check box names “Use”. Check that box and choose Regular Expression. Now to the right of the box where you type the text, there is a glyph that will fly out a regular expression character helper. You can type in text in Management Studio and test a regular expression against it. 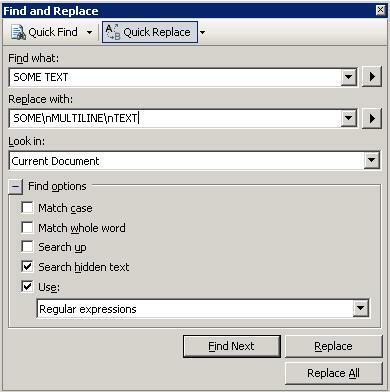 You can also leverage this regular expression functionality to do a multi-line find and replace. You can substitute in the old C# (C++) syntax \n for a new line. I needed to replace a block of text with a multi-line block of text and this worked beautifully! Don’t forget you can use Management Studio to search in files too. A nice GREP tool too! Hit the glyph just to the right of Quick Replace or Quick Find at the top and you’ll get the option to search in files. I’ve been needing a new demo machine for myself and finally bought a Dell Studio 16 – i7 processor (4 cores) and 8 gigs of ram. The only problem is that when you turn on the Hyper-V role, the system becomes unstable and BSODs because of the high end video card. For some stories, check here and here and here. I finally gave up and installed VMWare and everything works great. I’m a total Microsoft kind of person. I love not having to install anything I don’t have to, but I had to. Hyper-V just isn’t ready to handle these new processors and new video cards. VMWare is. And after all that, VMWare just works. It comes with all the virtual networks set up. They just work. There is a setting to optimize disk for performance by not waiting for disk write. This is perfect for demo machines. Once Microsoft remedies the Hyper-V situation, I’ll gladly switch back. Maybe I’m the only one, but I put one of my new Hyper-V imgages into a difficult state the other day by choosing the wrong network type. What I mean by this is that when Server 2008 came up (for the first time) and saw it was on the network (it was bound to the virtual NIC attached to the physical NIC on my laptop) it asked me if I was on a public network, home network or work network. I wasn’t thinking and said it was a public network. That makes it harder to access your VM as a UNC. I don’t know all the differences to these different settings, but I do know that if you choose public, that it isn’t discoverable from the netbios name. Make sure you use either Home or Work network.